My curry laksa obsession started 8 years ago, when I tried my first bowl from a noodle stall at my neighbourhood. 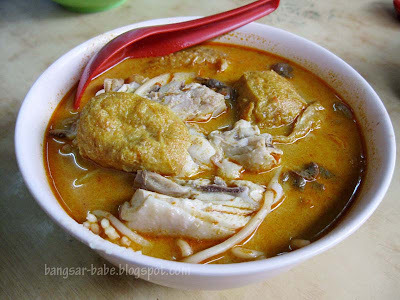 Since that day, I have almost always ordered a bowl of curry laksa whenever I spotted a stall selling it. Teluk Cempedak in Kuantan is my least favourite place to be during monsoon season, but I’ve heard so much about the curry laksa at Hoi Yin that I decided to put aside my reservations and see what’s so good about it. At 10am on a Sunday, the shop was packed with patrons, and to my surprise, more than half of them were Muslims. I asked the proprietor about this, to which she chuckled and replied, “Girl, our curry mee is halal.” It was wet and windy that morning — the perfect weather for me to indulge in a hot bowl of curry noodles. Unless you’re eating in an air-conditioned restaurant, the best time to indulge in curry laksa is on a rainy or cloudy day. That way, you wouldn’t walk away with sweat trickling down your face or worse, sweaty armpits. Business was very good. Tables and chairs had to be placed along the walkway to cater to the growing crowd. 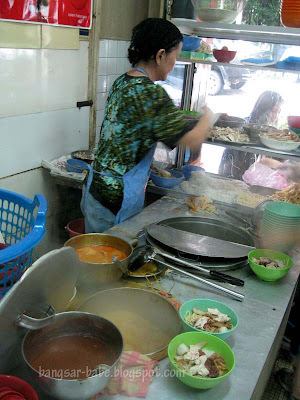 The noodles are available in 3 sizes; Jambo (RM4.20), Besar (RM3.50) and Kecil (RM3.20). 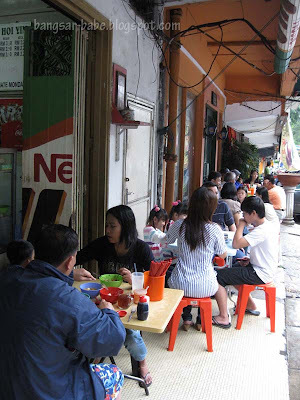 We placed our curry laksa orders, and waited. I finished my first cup of iced barley, ordered another one, and waited. Our noodles came after 40 long minutes. I greedily scooped the noodles onto my spoon and took a bite. Mmmmm….good stuff! It was hot and spicy, but also comfortingly creamy (lemak) and sweet. The spicy and aromatic soup was perhaps one of the tastiest curry broths I have ever had. I relished the piping soup, dotted with oil the colour of burnt orange, juicy pieces of chicken, raw cockles, crunchy bean sprouts and golden puff tofus. It was fragrant from the addition of coconut milk, shallot, assorted spices, turmeric, ginger, lemongrass and fresh curry leaves. The yellow noodles were firm yet springy, with no alkaline smell or taste. They were pretty generous with the cockles, which were fresh and to my delight, slightly bloody. I cannot stand rubbery cockles. 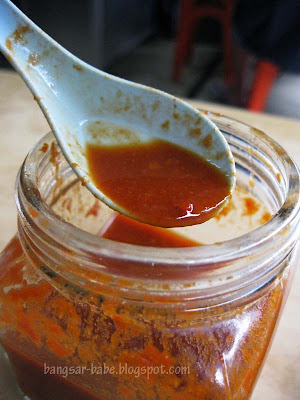 Instead of the usual chilli sambal, Hoi Yin gives you a tangy chilli sauce to eat with your noodles. Don’t be fooled by its looks. The chilli packed quite a punch, adding more depth and flavour to the already good bowl of curry laksa. As I was tucking into my second spoon, I heard the lady holler to her fellow helpers, “No more curry mee already!” Good thing we came 5 minutes earlier. Otherwise, we would have to settle for the mee sup or mee kicap. That would have been a terrible shame. I finished the entire contents of my bowl, right down to the last drop. rif usually never finishes his soup, but to my greedy dismay, he too, drank it to the last drop. “Oh well, there’s always next time!” I consoled myself. 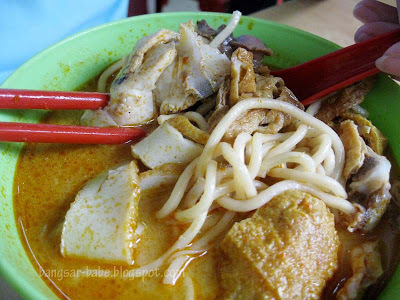 If you happen to be in Kuantan over the weekend, do drop by and give this curry mee a try. I’m not saying it is the best I’ve eaten, but it certainly is one of the better ones around. What I like about this place is that they speak English and Malay, so ordering was a breeze. 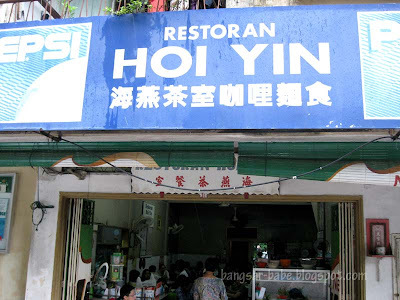 To get to the shop, drive towards the Teluk Cempedak beach and you will find Hoi Yin along the row of shops on your left. Verdict: Get here early to score yourself a bowl of curry laksa. It is worth the wait! omg, u make it sound as if kuantan is just next door! You also obsessed with curry laksa ka? waa..same here..
Have you try mee curry at Restaurant Berjaya at Bangsar? I think same row with Post Office. Is it good? I'm going to Kuantan this CNY. Hope Hoi Yin is open.. 🙂 Wanna try this.. Some more they are generous with cockles..! Good info babe..
Joe – Hahaha, ya meh?